Literally in the shadow of One World Trade is a memorial for September 11 that has been overrun by tourists since the days after the disaster. Its quiet dignity has been maintained, outlasting the dozens of hawkers who sold Twin Tower replicas just a few feet away. 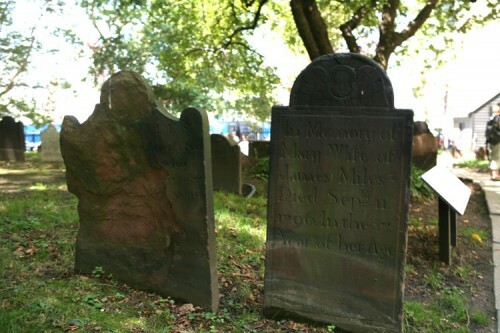 The memorial bears but one name, “Mary Wife of James Miles,” who died on September 11, 1796. Today’s New York Observer weighed in on the New York Post‘s claim that tourists are turning the September 11 Memorial into a glorified playground. “When the construction barriers finally come down, the lines will be gone, people will come and go as they please. They will pray and they will play, and that is how it should be,” wrote the Observer’s Matt Chaban. As the debate continues as to what constitutes appropriate behavior at the memorial, one need only walk one block east to take in two century’s worth of history on how New Yorkers memorialize. Mary Miles’s headstone sits in the churchyard of Trinity St. Paul’s Chapel, which served as the de facto memorial while the official one was being built. Without overt police supervision the small parish took on the unenviable task of welcoming millions into its historic walls and grounds. Its open gates and churchyard oaks have greeted office workers, picnicking parents, and frolicking children alike. It’s a clear example of what one hopes the memorial across the street will become. 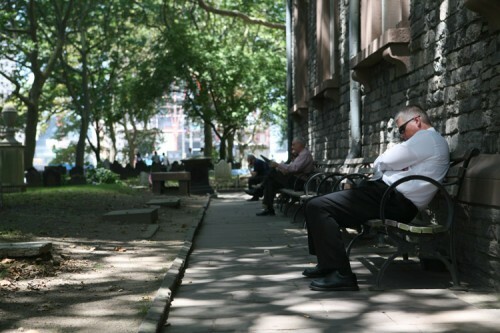 But the parish has a deep heritage of combining daily life with the act of memorializing. After all, the nation’s first official monument, commemorating General Richard Montgomery, fronts the church facade. While churchyard cemeteries were once a familiar sight in American cities, the construction of Paris’s Pére Lachaise in 1804 ushered in the era of the rural cemetery. In America, Mount Auburn in Cambridge, Massachusetts opened in 1831, followed by Greenwood in Brooklyn in 1838. The pastoral landscapes acted as some of the country’s first landscaped parks, where families often picnicked and played. By virtue of its location in one of the most densely populated area’s in the world, the new memorial is anything but rural. But that doesn’t preclude the notion of parkland that the memorial has the potential to encompass—even as city life continues amidst it. 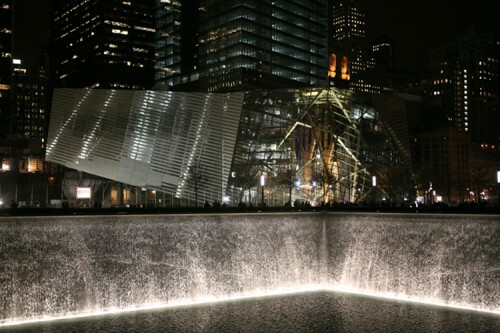 Decisions surrounding new World Trade Center were the result of a very democratic process, from the thousands of square feet of retail that are planned to abut the memorial below ground, to the swirl of pedestrian traffic above. Just last week, Paul Goldberger told AN, “Democracy is a great thing but it doesn’t always lead to the best architectural decisions.” A lot of voices were at play here. But if the history just one block east portends, when the construction and security barriers finally come down, the carnival atmosphere will dissipate and the memorial will eventually inhabit its rightful, respectful sense of place.